When you create a presentation and then save it as a PowerPoint template (.potx) file, you can share it with your colleagues and reuse it again. 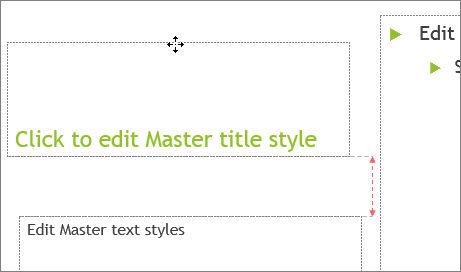 To create a template, you'll need to modify a slide master and a set of slide layouts. 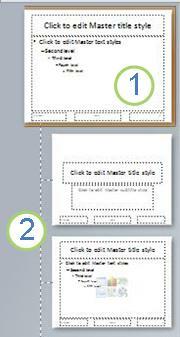 On the Design tab, select Slide Size > Custom Slide Size and choose the page orientation and dimensions you want. On the View tab, in the Master Views group, choose Slide Master. The slide master is the largest slide image at the top of the slide thumbnail list, to the left of your slides. Associated slide layouts are positioned beneath the slide master. To add a colorful theme with special fonts and effects, click Themes, and choose a theme from the gallery. Use the scrollbar on the right to see more themes. To change the background, click Background Styles, and choose a background. Click Insert Placeholder, and select the type of placeholder you want to add. On the slide master or slide layout, click and drag to draw the placeholder size. Tip: To resize a placeholder, drag the corner of one of its borders. To move a placeholder around on a slide master or slide layout, select the edge and then drag it into a new position. To remove an unwanted placeholder in a slide master or slide layout, select it in the slide thumbnail pane, and then select the border of the placeholder on the slide and press Delete. 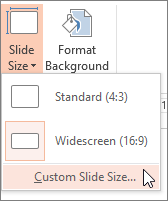 To set the page orientation for all of the slides in your presentation, click Slide Size > Custom Slide Size. Under Orientation, choose Portrait or Landscape. 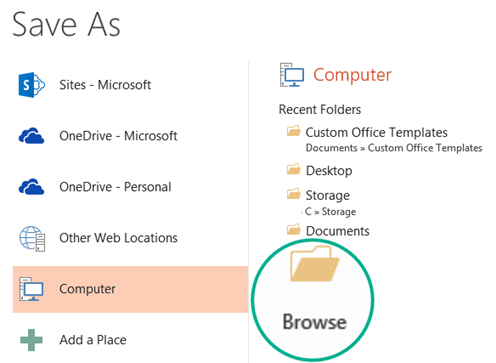 On the File tab, click Save As (or Save a Copy, if you are using Office 365). Under Save, click Browse to open the Save As dialog box. 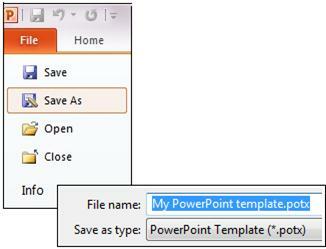 In the Save As dialog box, in the Save as type list, choose PowerPoint Template. 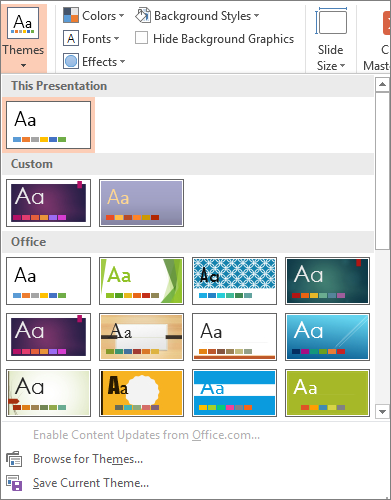 When you choose the "template" type, PowerPoint automatically switches the storage location to the appropriate folder, the Custom Office Templates folder. In the Save As dialog box, in the File name box, type a file name for your template, or do nothing to accept the suggested file name. To use your template for a new presentation, click File > New. 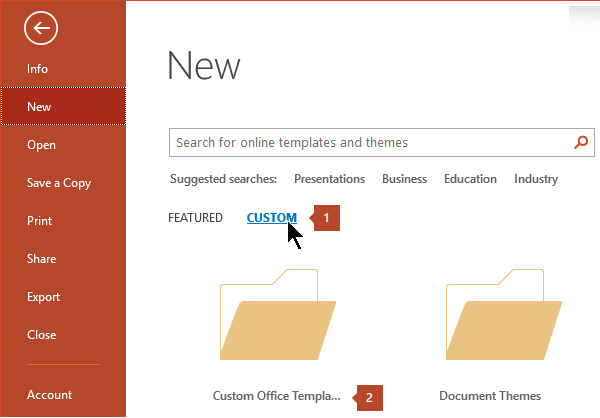 Then click Custom > Custom Office Templates, and then double-click the template you saved. See Apply a template to your presentation. On the File tab, click Save As, in the File name box give your template a name, and then in the Save as type box, select PowerPoint Template (*.potx). On the Design tab, select Page Setup, and choose the orientation and page dimensions you want. Tip: In Slide Master view, in the slide thumbnail pane, the slide master represents the larger slide image, and the associated layouts are smaller, positioned beneath it. To remove an unwanted, default placeholder from a layout, in the slide thumbnail pane, click the slide layout that contains the placeholder, click the border of the placeholder in the presentation window, and then press DELETE. On the Slide Master tab, in the Master Layout group, click Insert Placeholder, and then click Text. Click a location on the slide master, and then drag to draw the placeholder. Type descriptive text that prompts the users of your template to enter specific information. To add custom prompt text, see Add a text placeholder with custom prompt text. To add other types of placeholders that contain content such as pictures, clip art, screen shots, SmartArt graphics, charts, movies, sounds, and tables, on the Slide Master tab, in the Master Layout group, click Insert Placeholder, and then click the type of placeholder that you want to add. To apply a theme (to include color, formatting, effects, in a layout) to your presentation, on the Slide Master tab, in the Edit Theme group, click Themes, and then select a theme. 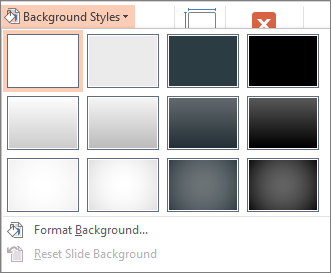 To change the background, on the Slide Master tab, in the Background group, click Background Styles, and then select a background. To save your template, click the File tab, and then click Save As. In the File name box, type a file name, or do nothing to accept the suggested file name. In the Save as type list, click PowerPoint Template (.potx). When you choose the "template" type, PowerPoint automatically switches the storage location to the appropriate folder, the \Program Files\Microsoft Office\Templates\ folder. To use your template for a new presentation, click File > New. Then click My templates. In the New Presentation dialog box, select the template you saved, and click OK. If you need assistance applying your new template to a presentation, see Apply a template to your presentation. 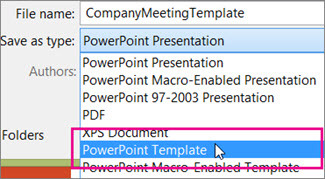 To apply a new or different PowerPoint 2007 template that already exists, see Apply a template to your presentation. 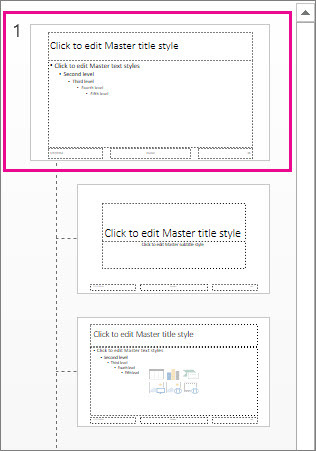 When you create a template, add any content to the slide master in Slide Master view that you want to protect from being changed by users of your template, such as instructional prompt text, logos, header and footer information, subject matter content, a background, formatting, colors, fonts, and effects. Users of your template will work in Normal view, guided by the instructional prompts that you added. The template users will replace the instructional prompt text and other placeholder content with data that is specific to their own project or presentation. On the View tab, in the Presentation Views group, click Slide Master. On the Slide Master tab, in the Edit Master group, click Insert Slide Master. In the slide thumbnail pane, the slide master represents the larger slide image, and the associated layouts are positioned beneath it. Many presentations contain more than one slide master, so you may have to scroll to find the one that you want. 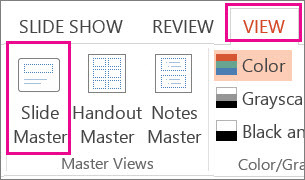 To remove any of the built-in slide layouts that accompany the default slide master, in the slide thumbnail pane, right-click each slide layout that you don't want to use, and then click Delete Layout. 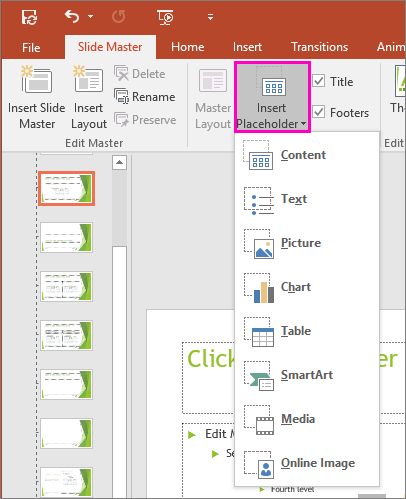 To remove an unwanted, default placeholder, in the slide thumbnail pane, click the slide layout that contains the placeholder, click the border of the placeholder in the presentation window, and then press DELETE. Type descriptive text that prompts the users of your template to enter specific information. To add other types of placeholders that contain content such as pictures, clip art, SmartArt graphics, charts, movies, sounds, and tables, on the Slide Master tab, in the Master Layout group, click the type of placeholder that you want to add. To apply a theme (to include color, formatting, effects, in a layout) to your presentation, on the Slide Master tab, in the Edit Theme group, click Themes, and then click a theme. To change the background, on the Slide Master tab, in the Background group, click Background Styles, and then click a background. 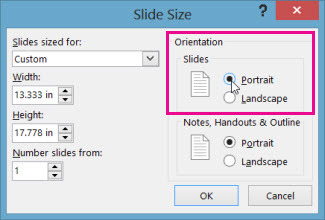 To set the page orientation for all of the slides in your presentation, on the Slide Master tab, in the Page Setup group, click Slide Orientation, and then click either Portrait or Landscape. In the Header and Footer dialog box, on the Slide tab, select the Footer check box, and then type the text that you want to appear at the bottom of your slides. To display the footer content on all slides, click Apply to All. For more information about using footers, see Show footer information on your slides. In the Save as type list, click PowerPoint Template (*.potx). If you need assistance applying your new template to a presentation, see Apply a template to a new presentation. You can't create a template in PowerPoint Online. You have to use a desktop version of PowerPoint instead.